On November 2nd 1917 Lionel Walter Rothschild received a historic letter. The British zoologist was a cousin of the Baron Edmond James de Rothschild, who sponsored the Jewish settlement in Israel. Of the family of famous bankers, he was actually the black sheep. He was far more interested in animals than money, spending most of his time at the zoo he established himself, focusing mainly on the study of birds and insects. He also became know for his ritual of exploring the streets of London in a carriage drawn by four ... zebras. 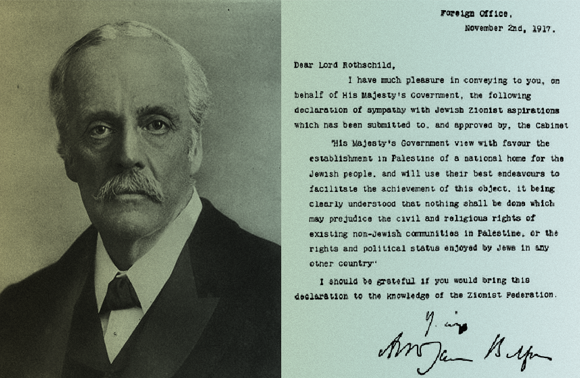 The letter, now known as the “Balfour Declaration”, did not surprise the Zionist movement. Such a declaration was the object of longing for decades, ever since Herzl had been trying to convince the major rulers and those of influence with the hope of obtaining a charter for Jewish settlement in Israel. The statement was made in November 1917 thanks to a combination of political circumstances and diplomatic efforts of a number of Zionist leaders and, thanks to the intellect and acuity of one scientist, who became the first president of Israel. Chaim Azriel Weizmann was born in 1874 in Motol, White Russia. As a youth he studied in Pinsk, and already from a young age stood out in the subjects of chemistry and science, and also with a Zionist tendency of course. He continued his studies in Germany and Switzerland, where he received his Doctorate in Chemistry for his research in the field of manufacturing paint. In 1904 he got a job at the University of Manchester in Britain, and settled there with his wife Vera who was a pediatrician. In 1910 he received British citizenship. In Manchester, Weizmann continued to work in the development of methods for the commercial production of paint, and also listed several patents for his work. Later he developed a method for the production of camphor oil, a product in demand at the time, and sold the patent to a large cosmetics company in Switzerland. During this period, Weizmann made a point to attend the Zionist Congresses in Europe, and in 1907 he visited the land of Israel, and was fascinated by the lives of farmers and their efforts to hold on to the land despite the difficulties they were facing to. Among other things, his tours combined some professional training, and Weizmann visited the Pasteur Institute in Paris, where he worked in the Department of Bacteriology and learned how bacteria can be exploited for the production of organic material. At the end of the 19th century there was an increased demand for rubber all over the world, mainly due to the fast development of the industry. There was a shortage of natural rubber, which was mainly produced from the sap of tropical trees. Many scientists realized that the development of synthetic rubber would be an economic goldmine, and so did just that. Chaim Weizmann decided to work in the field and developed a process for the production of a substance called isoprene, which is the starting material of synthetic rubber. The biggest problem in the process developed by Weizmann was the requirement for isoamyl alcohol (CH3)2CHCH2CH2OH)). This material is needed to make isoprene, but was not available in large quantities like those required in industrial production. Weizmann began to delve into the process bacteria fermentation and grew bacteria in low-oxygen conditions in an effort to find a microbe that produces the isoamyl alcohol fermenting sugar. Concurrently, he worked in laboratories in Manchester and Paris, and thought he had finally produced the long-awaited large amount of material. However, when he distilled the liquid from the fermentation tank it turned out to contain only acetone and butanol at a very high level of purity. William Perkin, a research associate of Weizmann called the discovery “useless” and suggested discarding the idea. But Weizmann thought he could make synthetic rubber from a base of butanol, and did not abandon the idea even when he separated from his business partner Halford Strange. He continued on his own to perfect the process and found that certain bacteria isolated from corn produces very large quantities of butanol and acetone. Weizmann named the bacteria clostridium acetobutylicum, based on the name of the products used. After natural rubber prices fell and the development of synthetic rubber was no longer economically worthwhile, Weizmann eventually abandoned his work. The turning point came in 1914. At the outbreak of the Great War (later called World War I), there was a huge demand for acetone in the UK and other countries. Acetone was needed for making cordite, a mixture for gunpowder that replaced shelling and other types of ammunition. By the end of the 19th century, the British army used cordite gunpowder, cordite decreased the heat produced by firing of guns and thus allowed for higher firing frequency. Even more important – cordite combustion does not result in smoke production, and thus did not disclose the location of the guns. To produce cordite it is necessary to dissolve some components of acetone. Up until the war, acetone was produced mainly from refining minerals such as calcium acetate, which came from Germany and Central Europe. But now Germany was an enemy state, so Britain had to find another source of large quantities of acetone - and fast. Here enters Weizmann and the bacteria he isolated. He answered the call of the British War Office and presented the bacteria and the acetone production process. He also gave the government the rights to its development without charge, and made do with just the royalties. Soon after Weizmann was appointed director of the Royal Navy laboratories, and conquered the production of industrial acetone, rescuing the British shells crisis of the early war: it was a major contribution to the Allied victory. The bacteria responsible for the production of acetone was given the official name “The Weizmann Organism”. While Chaim Weizmann was creating tons of acetone for shells for Britain, with the expected fall of the Ottoman Empire, the fate of the land of Israel after the war became a hot topic. In 1916, Britain and France signed an agreement for the distribution of influence in the Middle East (the Sykes-Picot agreement, named after the two diplomats who signed it). However, the agreement was only signed by the two countries to try and strengthen their influence in the region, hoping to attain real control. To this end, the British sought to buy the favor of the two camps in Israel, the Arabs and the Zionists - who both demanded recognition of their right to the land. The enormous impact Weizmann had made became very helpful for influencing senior administration officials in London. Thanks to his position in the military industry he was close to Winston Churchill, who was the First Lord of the Admiralty, resigned and later appointed at end of the war as Minister of Munitions and David Lloyd George, who was Minister of Munitions and in 1916 was elected prime minister. Weizmann recruited to the Zionist cause Herbert Samuel, the Jewish Home Secretary, who later became the first British High Commissioner of Palestine. In July 1917, Weizmann worded the proposal of the statement, along with Nahum Sokolow, and submitted it to the British government. Three months later, the government approved a limited and softened version of the proposal, which still contained the promise the Zionist movement longed for – the recognition of the right of Jewish people to establish their national home in the land of Israel. To further soften the official statement, it was sent to Rothschild, and not to the Zionist movement itself. But it did not diminish its importance, and the date on the letter, November 2nd 1917, became a day of celebration in the history of Zionism and the State of Israel. A month and a half after the Balfour Declaration, the forces of General Allenby conquered the land of Israel. As British rule became fact, Zionism still awaited the full realization of the statement, but the historical sequence of events still required another 30 years and millions of Jews killed in the Holocaust, before the national home was established. Weizmann himself almost completely withdrew from all scientific activities after the war to devote himself to the Zionist enterprise. 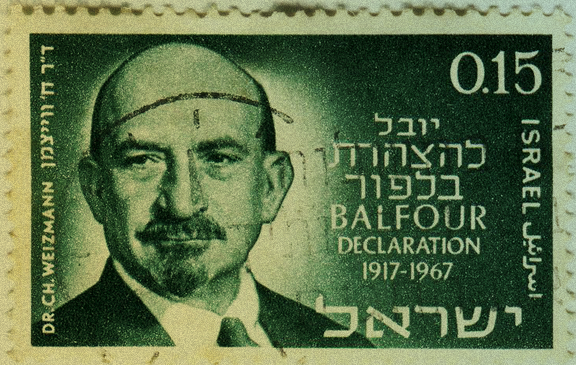 Among many activities, Weizmann established the Hebrew University. In 1921 he was elected President of the World Zionist Organization and represented the struggles of the Jews of the world and of the land of Israel with the mandate government. In the early thirties Weizmann settled in Rehovot and resumed his scientific research at the institute founded by Lord Israel Sieff (the owner of the chain “Marks & Spencer”), which preserved the name of his late son as the “Daniel Sieff Research Institute”. Weizmann's house, right next to the institute, was used mainly as the Ministry of Foreign Affairs for the Zionist movement, where Weizmann continued his work for the establishment of the state. With the realization of his dream, he was appointed the first president of the young state. On Weizmann’s 75th birthday in November 1949, the institute was renamed in his honor and has since been called the Weizmann Institute of Science. In 1952, Weizmann died at home, leaving his young state with a legacy of diplomatic, national and military achievements primarily relying on intellectual ability and a solid foundation of scientific research.